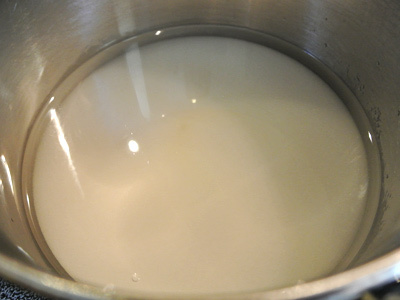 Start by making a simple syrup of sugar and water. Heat on low until sugar dissolves stirring as you go. Continue stirring until it just begins to boil, turn down the heat and add the zest of one lime. Remove from heat and let syrup cool. 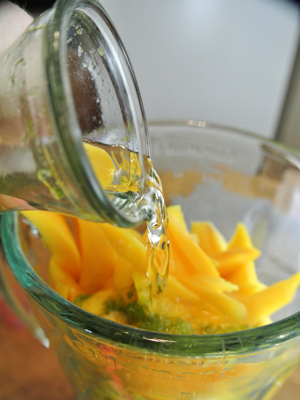 Along with the syrup, you’ll need 3 mangos, juice of 2 limes and a pinch of salt. 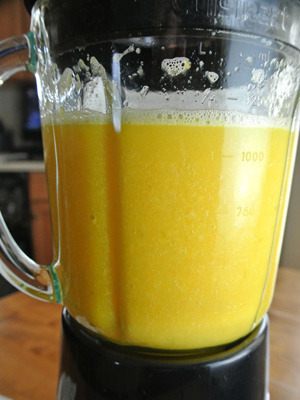 Once you’ve peeled and sliced the mango’s, add to a blender. 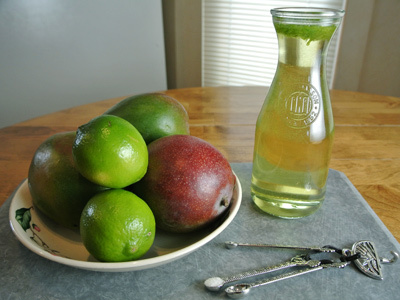 Pour in the lime juice, simple syrup and salt. Puree mixture in the blender. Looks like orange juice, but much thicker. 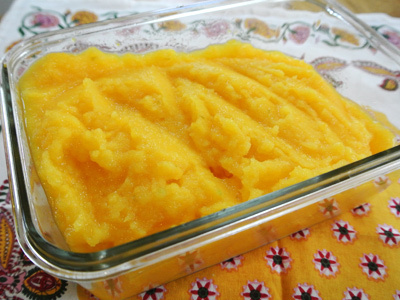 Transfer the mango puree into the fridge for 30 minutes to an hour to chill. Pour into your ice cream maker and process according to directions. It’s still soft and needs to go in the freezer for a couple hours. Combine the sugar and water in a saucepan over low heat. Dissolve the sugar and bring the syrup just to a boil. 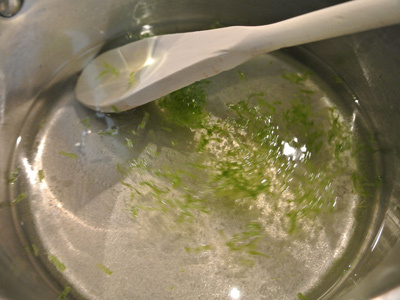 Stir in lime zest then remove from heat to cool the syrup. 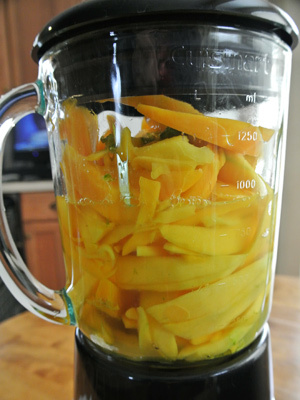 Peel and slice the mangos, juice the limes and place in a blender along with the cooled syrup and salt. Puree the mixture until smooth. Transfer to the refrigerator to chill. Pour contents into your ice cream maker and process according to the makers instructions. 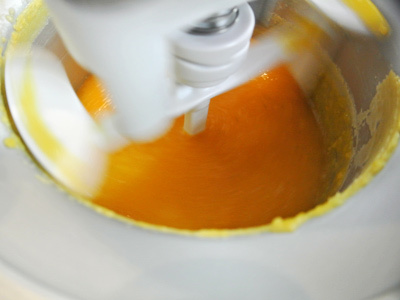 Place the sorbet into the freezer until firm. looks great! 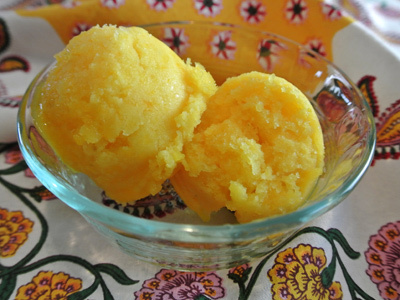 wished it was tropical fruit season here and wished i had an ice cream maker! Oh, I think you would enjoy an ice cream maker! I got mine for Christmas and it’s been fun making sorbets, frozen yogurts and ice cream! Mango is one of my favorite tropical fruit. Never had them as sorbet but I bet it’s refreshing and delicious! Love the combination of lime you got there too. Thanks, Anne! 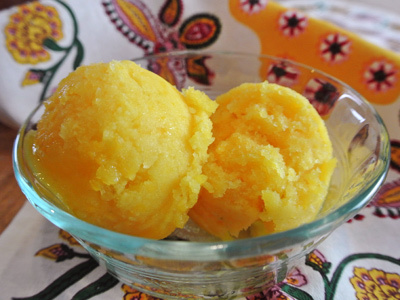 Mango works great in a sorbet, the key is picking a ripe mango that will blend smoothly!